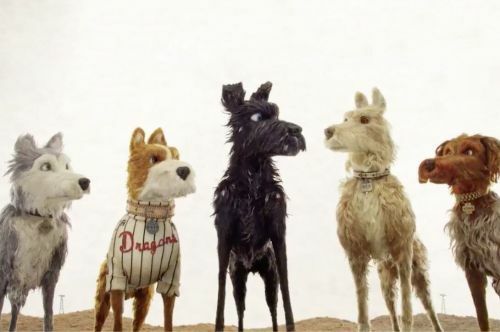 Wes Anderson returns to animation with “Isle of Dogs,” a showcase of expectedly eye-popping production design and art direction that partially obscures a pricklier, flintier corner of the world than the one adapted from Roald Dahl’s “Fantastic Mr. Fox” in 2009. Writing the screenplay from a story credited to himself, Roman Coppola, Jason Schwartzman, and Konichi Nomura (who also performs in the film as Mayor Kobayashi), the particular auteur embarks on an often melancholy dystopian odyssey set in a hyper-stylized near future in which an infectious “dog flu and snout fever” epidemic sees the entire pooch population of a fictionalized Japan quarantined on the grim Trash Island. Predictably paying wall-to-wall auditory and visual homage to influential cinematic heroes (both Japanese and non-Japanese), Anderson doesn’t achieve the masterful emotional storytelling of Vittorio De Sica’s “Umberto D.” (for my money the greatest dog movie ever made), but anyone who has ever stared into the soulful eyes of a loyal hound will cheer the mission of protagonist Atari Kobayashi (Koyu Rankin), a boy determined to reunite with his best friend Spots (Liev Schreiber), the very first pup to be banished. Aided by a pack of four-legged exiles, Atari’s quest is merely the pretext for Anderson’s latest manifesto on the politics of resistance and rebellion. Additionally, Emily Yoshida extends the no-subtitle conversation in an intriguing anecdotal survey summarized for “Vulture” with the explanatory lead “What It’s Like to Watch ‘Isle of Dogs’ as a Japanese Speaker.” Like Chang, Yoshida stops short of full condemnation, placing the movie’s narrative and design flourishes in a category she describes as a “kind of opportunism,” resulting in a “Heightened essence of the Japanese culture as filtered through a Western understanding.” Beyond the pair of reactions cited above, many critics have tagged American exchange student Tracy Walker (Greta Gerwig) as a white savior, while others have remarked on the function of Frances McDormand’s Interpreter Nelson. And despite the inclusion of Scarlett Johansson (more or less inhabiting the Felicity Fox role of coolheaded wisdom-imparter), Yoko Ono, Kara Hayward, and a scene-stealing Tilda Swinton, Anderson once again identifies most closely with the conversation-dominating male participants. No females belong to the central group of mutts made up of Chief (Bryan Cranston), Rex (Edward Norton), King (Bob Balaban), Boss (Bill Murray), and Duke (Jeff Goldblum) -- the last four Anderson regulars -- and that gender-divided reality is at least as awkward and problematic as any overt or covert stereotypes. "Isle of Dogs" is currently playing in Minneapolis and will open at the Fargo Theatre on April 13.